Before it gets too cold, there are a few things you will want to do to make sure your wood fence is ready for the fall. Fall is definitely here in Northern Virginia! Leaves are changing and temperatures are dropping. Before it gets too cold, there are a few things you will want to do to make sure your wood fence is ready for the fall. Fall tends to be a rainy time of year. When that moisture gets trapped in the grain of your wood fence, it becomes susceptible to mold and could even start to rot. Protect your wood fence from these problems by applying a sealant. First, make sure the wood has been dry for at least 24 hours, then apply the sealant. This will keep your wood fence moisture-free all fall long. All of that fall rain isn’t just dangerous for the wood in your fence, but it can actually cause structural damage to the fence itself. Heavily-saturated soil around your fence posts can cause them to shift. Too much shifting, and your whole fence may come tumbling down. Make sure there isn’t any excess soil or debris around your fence posts. 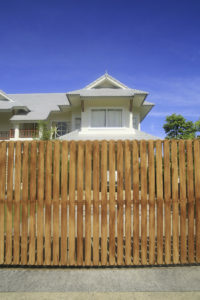 Check your wood fence regularly to make sure it is still straight. If you notice any slight slanting, adjust it right away. After storms and high winds, check your fence for damage. Make any necessary repairs. Keep your wood fence free of leaves, sticks, and other fall debris. If any of your wood fence’s boards become damaged, replace them right away. Performing these small tasks and getting rid of small problems right away can prevent costly problems in the future. This entry was posted on Friday, October 27th, 2017 at 2:13 pm. Both comments and pings are currently closed.